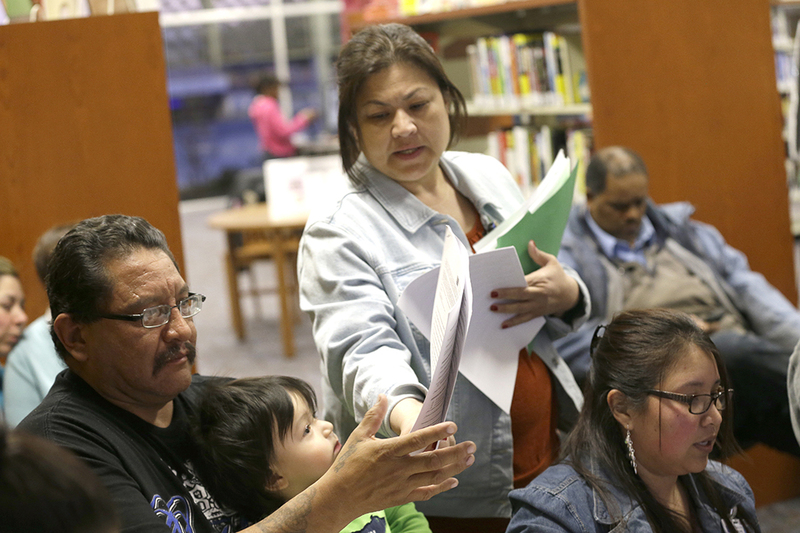 A health network patient navigator, center, helps a man with documents during an Affordable Care Act enrollment event at a library in Texas, February 2015. More consumers will find low-cost plan options in 2018 than in past years, including free plans. Today is the first day of open enrollment for 2018 coverage through the health insurance marketplaces. Consumers have from November 1 to December 15 in most states to switch plans or select new coverage. The marketplaces are open for business and will offer a wide range of affordable plans, including more low-cost plans than ever before for subsidized consumers, despite a turbulent past year for the Affordable Care Act (ACA). Subsidized consumers are protected from premium increases, including this year’s 36 percent increase in the benchmark silver plan average resulting from the Trump administration’s continued attempts to sabotage the ACA. About 80 percent of HealthCare.gov consumers can find coverage next year for $75 or less, a higher proportion than ever before, according to the U.S. Department of Health and Human Services (HHS). A significant number of consumers will have options that have a net premium—the premium after accounting for any premium tax credits—of less than $10 or that is even free. CAP analysis (see Methodology) revealed hundreds of scenarios in which consumers would be able to obtain bronze, silver, or gold coverage for $0, options that were not as widely available at that price in 2017. We find that a single 27-year-old making $25,000 can obtain coverage for less than $20 in more than half of counties. Financial assistance is available to eligible marketplace consumers, just as is has been in the past. Low- and middle-income consumers can receive premium tax credits to lower their monthly payments, and those eligible for cost-sharing assistance have access to plans with reduced deductibles and out-of-pocket costs. However, unusual patterns in 2018 plan pricing in response to Trump administration sabotage make it more important than ever for consumers to shop. The plan with the lowest premium or the plan in which a returning consumer would be re-enrolled automatically may not necessarily be the one with the greatest value. Marketplace plans are available to consumers in every single county in the country. We find that among the 39 states using the federal HealthCare.gov enrollment platform, the average consumer has five issuers offering marketplace coverage in their state in 2018, compared with six in 2017. (see Table 1) The net decrease is due to some issuers exiting the marketplaces because they financially struggled to adapt to the new market—though performance for the market overall had been improving through early 2017—as well as to uncertainty generated by the Trump administration’s opposition to the ACA. However, other issuers have expanded their offerings, and we found 11 instances of issuers entering a state’s marketplace in 2018. While the number of plans available is down slightly relative to 2017, as shown in Table 1 below, the average consumer will find multiple issuers and dozens of plans to choose from when shopping for 2018 coverage. * About 71 percent of marketplace enrollees have two or more issuers offering coverage in their county in 2018, and nearly half—45 percent—can pick from three or more issuers. The average consumer will have a total of 26 plans to choose from, including seven expanded bronze or bronze plans; 12 silver plans; four gold plans; one platinum plan; and, for those eligible, one catastrophic plan. One reason consumers have been receiving mixed messages is that the sticker price for marketplace plans will increase dramatically in 2018. By our calculations, the average benchmark second-lowest silver plan increased by 36 percent between 2017 and 2018. Among the various metal tiers, the 2017–2018 increase in the average premium is 18 percent for lowest-price platinum; 18 percent for lowest-price gold; 34 percent for lowest-price silver; and 17 percent for lowest-price bronze, including the new expanded bronze plans. The 2018 increase in silver plan rates is unusually high in most states because the Centers for Medicare & Medicaid Services (CMS) and many state insurance commissioners had instructed insurance companies to raise silver plan premiums to make up for the Trump administration’s failure to reimburse them for cost-sharing reductions (CSRs) provided to low-income consumers. The Kaiser Family Foundation found that Trump’s decision to cancel CSR payments resulted in a 7 percentage point to 38 percentage point surcharge on silver plans in 2018. 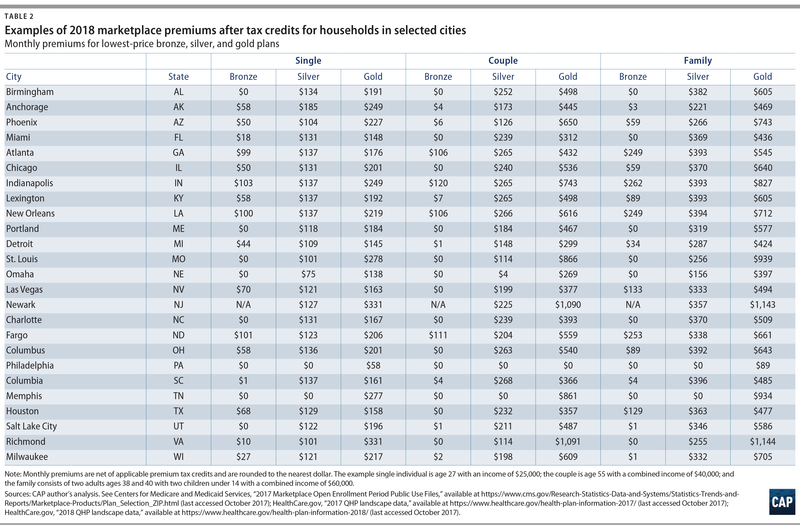 For individual consumers, however, affordability depends on premiums after any applicable tax credits. Because the ACA’s premium tax credits are pegged to the benchmark premium, they insulate eligible consumers from rate changes. For example, the benchmark premium rose 24 percent in 2017, but the average premium paid by consumers with advance premium tax credits, $106 per month, did not change between 2016 and 2017. The increase in the benchmark silver plan is greater than those of other metal tiers, and as a result, many consumers may end up with a dramatically lower premium in 2018, particularly if they shop carefully. Some consumers may even have options for coverage that cost them just pennies or are even free, as analyses by the consultancy Oliver Wyman and by the Kaiser Family Foundation have demonstrated. Although the demographics of marketplace enrollment differ by region, the households in these examples are typical in that they have incomes around 200 percent to 250 percent of the federal poverty level (FPL), in the middle of the income range eligible for premium tax credits. In 2017, 71 percent of HealthCare.gov enrollees had incomes below 250 percent of the FPL. The marketplaces contain a mix of older and younger consumers: 36 percent of enrollees were under age 35, 37 percent were ages 35 to 54, and 28 percent were age 55 or older. The ACA’s rules cap the 2018 premium for a single individual who is eligible for tax credits and makes $25,000, or 207 percent of the FPL, at $137 per month for benchmark coverage. Any difference between that amount and the sticker price of the benchmark silver plan in her local area is covered by premium tax credits, and she can apply that tax credit toward the marketplace plan of her choice. In fact, our example 27-year-old could use her premium tax credit to receive bronze coverage for free in Birmingham, Alabama; Charlotte, North Carolina; Memphis, Tennessee; Philadelphia; or St. Louis and for just 27 cents per month in Salt Lake City. In Memphis and Philadelphia, she could pick a higher-value silver plan and still pay nothing after tax credits. We found numerous examples of free plans throughout the country using the 2018 plan data for the 39 states that use the HealthCare.gov enrollment platform. Our analysis shows that the 27-year-old would be able to find a plan option for $0 in more than one-quarter of the total 2,722 counties in the data set, which also account for about one-quarter—23 percent—of all enrollment in HealthCare.gov states. She has an option costing less than $10 per month in 40 percent of counties and options costing less than $20 per month in 52 percent of counties. Subsidized consumers who are older, have lower incomes, or live in higher-priced markets are more likely to have $0 options in the marketplace. Low-dollar options are even more prevalent for our example older couple and family. The family can cover all four members for $0 in 54 percent of counties and for less than $10 per month total in 66 percent of counties. The 55-year-old couple would have a $0 option in 64 percent of markets and an option costing less than $10 in 85 percent of markets. In past years, most marketplace consumers could find plans for $75 or less after tax credits. In 2018, 80 percent of returning marketplace customers have an option at less than $75 per person per month, compared with roughly 70 percent in past years. Although $0 plans are not new, the widespread availability of options at or near $0 is the consequence of 2018 silver plan premiums increasing faster than those for other metals next year. We find that in 2017, any plan under $10 would have been available in just 4 percent of counties for the 27-year-old, in 48 percent of counties for the couple, and in 14 percent of counties for the family of four. In some counties, the benchmark is so high that consumers may be able to find more generous gold-tier plans at very low prices. Gold plans are designed to cover 80 percent of an enrollee’s expected health care costs. We found 131 counties where the 55-year-old couple in our example could obtain gold coverage for less than $10 per month. In past years, plan pricing has generally reflected actuarial value—the expected proportion of costs that the plan is expected to cover—with bronze premiums being the least expensive, followed by silver, gold, and platinum. This year, however, gold plans are often priced below silver. 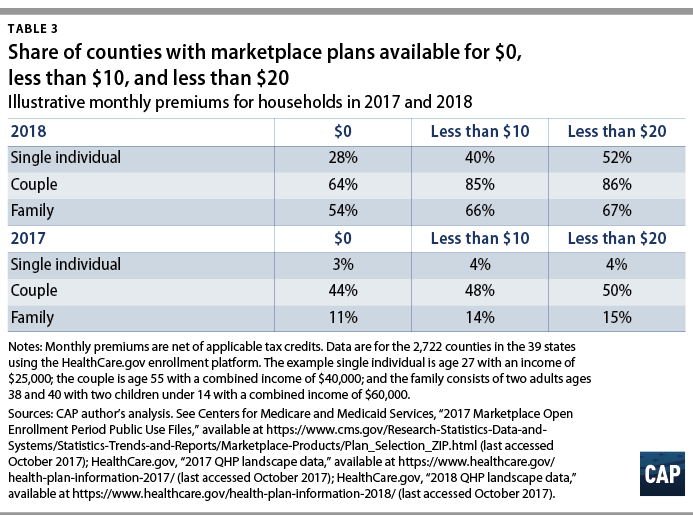 We found that in 596 counties, which represent 15 percent of 2017 marketplace enrollment, the premium for the lowest-price gold plan in 2018 is below that of the benchmark silver plan. In 459 counties, the lowest-price gold plan costs less than all silver plans. Consequently, it will be more important than ever for both new and returning marketplace consumers to consider all their options. By default, the HealthCare.gov website displays plans sorted by net premium, which is helpful for consumers seeking the lowest monthly payment possible. Consumers who desire to minimize their total costs for care, including out-of-pocket costs, will also need to account for plan networks and deductibles. Those who have incomes below 250 percent of the FPL and are eligible for cost-sharing reductions, which increase the actuarial value of silver plans, should consider that higher-premium plans are likely to have lower deductibles, meaning that their plan benefits kick in sooner. President Trump may not want Americans to know it, but the Affordable Care Act reforms to the individual market continue to keep individual market coverage available and affordable for subsidized consumers. Despite Trump’s misleading claims that the ACA is failing, about 10 million consumers are enrolled in marketplace plans, and many who return to shop for 2018 will find that premiums are lower than ever before. Emily Gee is a health economist for Health Policy at the Center for American Progress. * The numbers resulting from our analysis may differ from similar reports by HHS, Avalere, and the Kaiser Family Foundation due to differences in methods for weighing averages, CMS plan landscape file versions, and the number of states included in the analysis. Our analysis uses publicly available data sets on marketplace plans and enrollment from CMS. We used the October 23, 2017, version of the 2018 individual market plan landscape file and the August 11, 2017, version of the 2017 plan landscape file. These files contain data only for the 39 states that use the HealthCare.gov enrollment platform. Our analysis does not include California, Colorado, Connecticut, the District of Columbia, Idaho, Massachusetts, Minnesota, Maryland, New York, Rhode Island, Washington, or Vermont, which operate their own state-based marketplaces. For our calculations of the premium tax credit for the 2018 plan year, we used the 2018 IRS subsidy schedule, 2018 individual-market age rating curves, and 2017 HHS poverty guidelines. For the 2017 plan year, we used the 2017 subsidy schedule, the 2017 age rating curves, and the 2016 poverty guidelines. Instructions on how to calculate the premium tax credit can be found in the original regulations and more recent guidance. The benchmark premium and applicable tax credits are determined by the proportion of the benchmark premium that covers essential health benefits (EHB). The tax credit can be used toward the EHB portion of a qualified health plan in any metal tier. Our estimate of premiums may differ slightly from actual premiums available on HealthCare.gov due to rounding. To generate statistics representative of the average consumer, we weighted state and national averages by county-level plan selections from the 2017 marketplace public use file. Our tabulations of issuers by state and county counted each five-digit Health Insurance Oversight System identification code as a unique issuer, following the convention HHS has used in its analyses.